To help keep digestion regular, probiotics in yogurt work great. 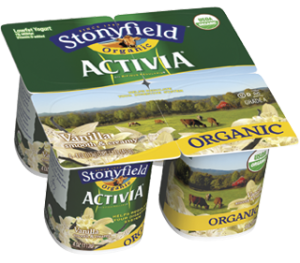 Stonyfield now came out with their own Activia yogurt which when eating for two weeks, can help to naturally regulate the digestive system. The yogurt comes in two flavors, vanilla and strawberry. Both are great and you cannot taste any differences between this and yogurts without probiotics. They are 90 calories, come in 4 ounce containers, and contain 5 grams of protein. I've been a Stonyfield fan for awhile now and like that they came out with their own yogurt with probiotics. I love trying new flavors of nuts and this is no exception. Lord Nut Levington makes the most unique flavors of peanuts that I have ever seen. The flavors pop out at you! Some of the ones that I was sent was the Rebel Mary (like a bloody Mary), Thai dyed, and Mamma Mia. I had a fun little taste testing with all of these. My favorite was probably the Rebel Mary because they were so unique! You could fully taste tomato and to me, it tasted like horseradish too. These were the strongest flavored peanuts that I have ever tried. They would be very good sprinkled on top of a salad or finely crushed and breaded on a chicken breast. All of the flavors were pretty good. The only one that I didn't like very much was the cinnapplooza. I liked the cinnamon flavor but didn't like the flavor of the apple which seemed fake. Rufus Teague is a company that sells different kinds of sauces. For my review, I was sent the honey sweet sauce, touch o' heat sauce, and the spicy meat sauce. Last weekend, I tried the touch o' heat sauce on some grilled chicken. I marinated the chicken a few hours ahead of time and fired up the grill for one last hurrah before the winter. The sauce stayed on the chicken nicely and tasted great. It was medium heat and had a nice sweet and smoky taste. I loved it!